The United States Congress designated the Superstition Wilderness (map) in 1964 and it now has a total of 160,236 acres. All of this wilderness is located in Arizona and is managed by the Forest Service. Although there is no guarantee that you'll find buried treasure, you are sure to discover miles and miles of desolate and barren mountains, seemingly endless and haunting canyons, raging summer temperatures that can surpass 115 degrees Fahrenheit, and a general dearth of water. Even the area's earliest known inhabitants, the hardy Hohokam and Salados peoples, established only very small villages and cliff dwellings in this harsh and fabulous country between 800 and 1400 a.d. The Wilderness value of the Superstitions has long been recognized. Established as a Primitive Area in 1939, it was named a pre-Wilderness Act "wilderness" in 1940, and became an official Wilderness in 1964. Elevations range from approximately 2,000 feet on the western boundary to 6,265 feet on Mound Mountain. In the western portion rolling land is surrounded by steep, even vertical terrain. Weaver's Needle, a dramatic volcanic plug, rises to 4,553 feet. The central and eastern portions are less topographically severe. Vegetation is primarily that of the Sonoran Desert, with semidesert grassland and chaparral higher up. Dense brushland covers hundreds of acres. A few isolated pockets of ponderosa pine may be found at the highest elevations. Despite the harsh setting, much of Superstition Wilderness, especially the Peralta and First Water Trails, is overused by humans. These two trailheads receive about 80 percent of the annual human traffic, and the U.S. Forest Service calls the 6.3-mile Peralta one of the most heavily used trails in Arizona. Other trails within the Wilderness are virtually untrodden. There are about 180 miles of trails, ranging from excellent to poor, as well as other unmaintained tracks. Group size is limited to 15 people and 15 head of livestock. Length of stay is limited to 14 days. 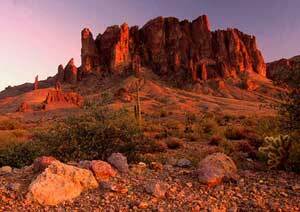 Planning to Visit the Superstition Wilderness? How to follow the seven standard Leave No Trace principles differs in different parts of the country (desert vs. Rocky Mountains). Click on any of the principles listed below to learn more about how they apply in the Superstition Wilderness.